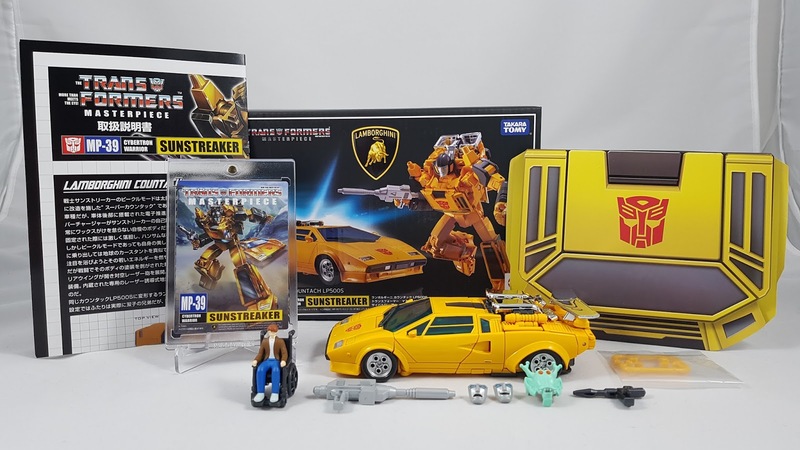 What a long time it's been waiting for an official Sunstreaker! So long in fact that many thought it was never going to happen! MP-12 Sideswipe released around the 2012 timeframe, and it was thought that Takara would take advantage of the Lamborghini licence and release a Sunstreaker quickly after. 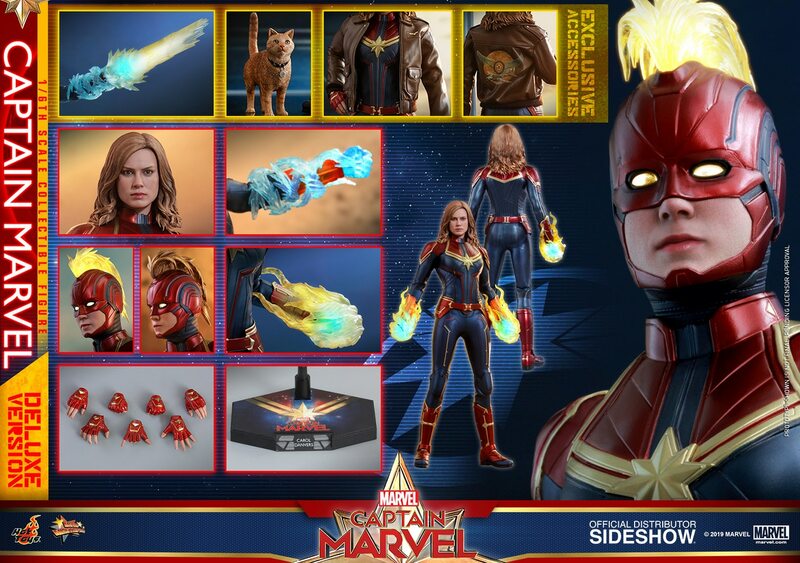 The set comes with a small array of accessories, along with the usual collector card and coin. The swap out face sculpts and alien mask show how Takara really have stepped it up to provide many options to replicate scenes from the original G1 cartoon series. The car mode is absolutely spectacular. The engineering in this toy is astounding at times, and together with MP-36 Megatron really showcase a new era in the Masterpiece series. The designers have stated in past interviews that their focus has shifted to greater cartoon accuracy, greater articulation, greater moving parts, and greater use of paint. MP Sunstreaker brings those aspects in spades! 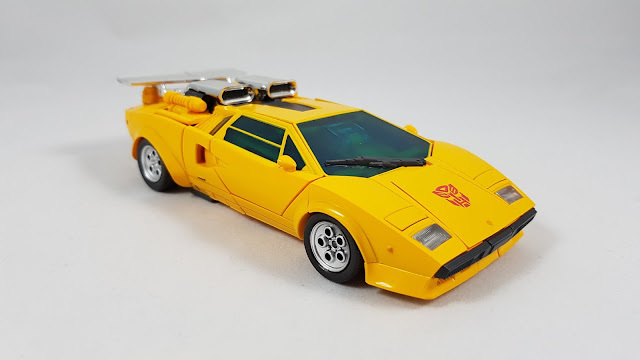 The classic car mode of Sunstreaker with the chromed engine at the rear is faithfully replicated. 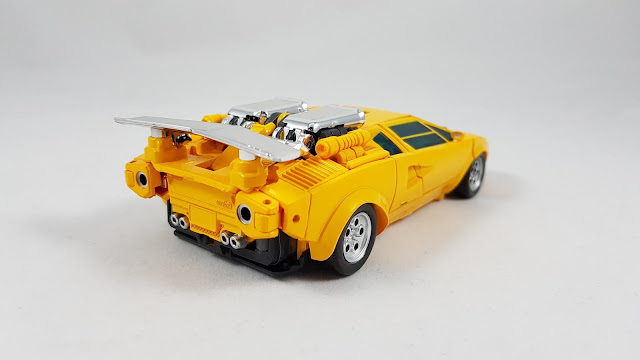 But the amazing thing is that they were able to design in a transformation sequence in the rear to be able to flip that exposed engine and revert it back to standard Countach mode! 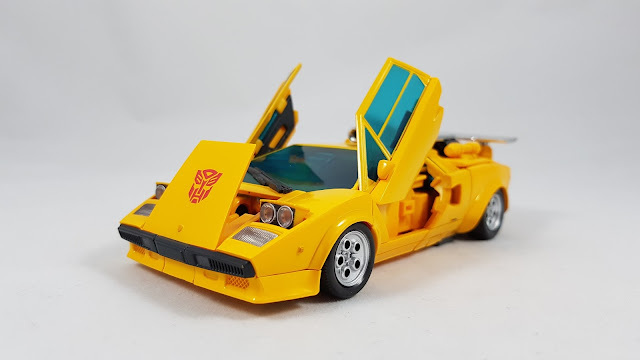 Many speculate that this is one of the challenges that took Takara years to overcome in order to obtain official Lamborghini licencing for this character. Regardless, the fact they've been able to do so in such a seamless manner is an incredible feat of toy engineering. The ability to fold the doors up and the head lights are the little attention to details that sets this figure apart. Not just from 3rd party figures, but also from his own MP brethren. The transformation is bot mode was daunting for me. 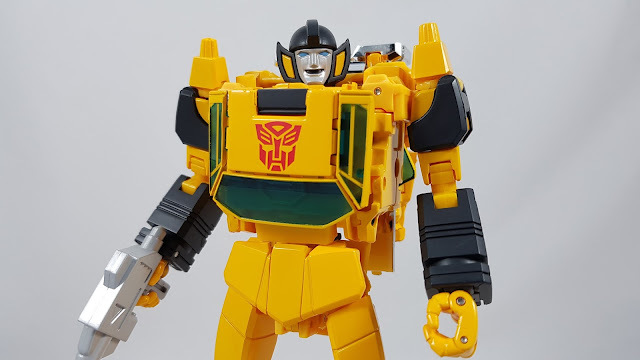 It takes me forever to transform MP figures, and with the higher level of complexity on Sunstreaker, it took me close to 40 minutes to complete the transformation the first time. There are some scary parts that I discuss in my video review. The rotating windscreen requires finesse to get by what tiny clearances there are around the waist. I'm not even sure how I managed it, but it took me several attempts and some swearing to get it done! The other scary part was the rotation of the backpack mechanism. Luckily I had read some reports of breakages at the location of the rotation. So I heeded the advice and rotated the part before clipping the backpack sections together. This certainly seems to require less force on the joint. But there are aspects of the transformation that are a joy, and worthy to be noted as "Masterpiece Moments". I love the leg and feet transformation, and the final result alone makes this Sunstreaker far better than any of the 3rd party version. The way they've incorporated all the folding parts and the ability to tightly fold and clip it all together is amazing. It creates a beautifully streamlined lower half that none of the other versions have. The "fake" windscreen doesn't bother me at all. The cartoon itself was a cheat that magically moved his Autobot insignia from the bonnet of the car to the roof of the car in the transformation. The way in which Takara have replicated that "cheat" is ingenious, and again creates a perfect cartoon accurate aesthetic in bot mode. The articulation in bot mode is amazing! Everything nicely holds together, with firm joints in all the right places. With ratchet hips, butterfly shoulders, pivot wrists, and all the other usual articulation points, you will be able to get this figure into some incredible poses. It far exceeds that of previous MP figures, and sets a very high bar for future MPs. 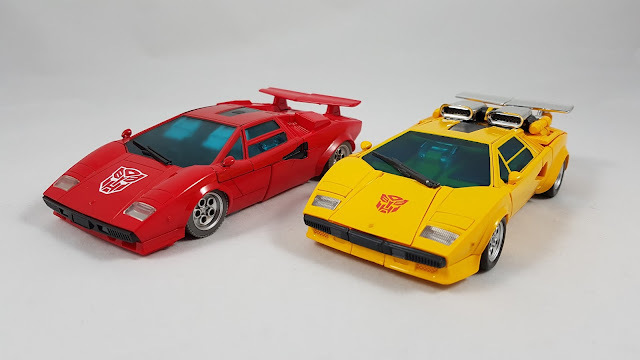 Together with his brother Sideswipe, Takara have given us two incredible Lamborghini Countach figures. The first spawned a new age in the MP series back in 2012 along with Soundwave. 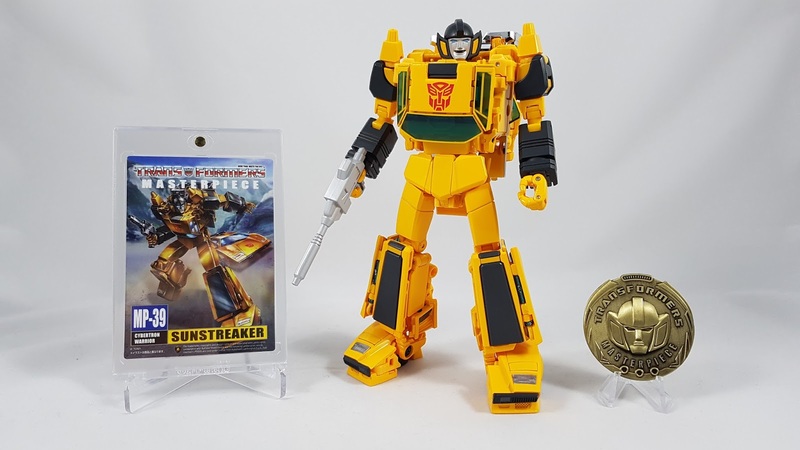 And now the second in Sunstreaker helps launch this new era that takes Transformers engineering to the next level. 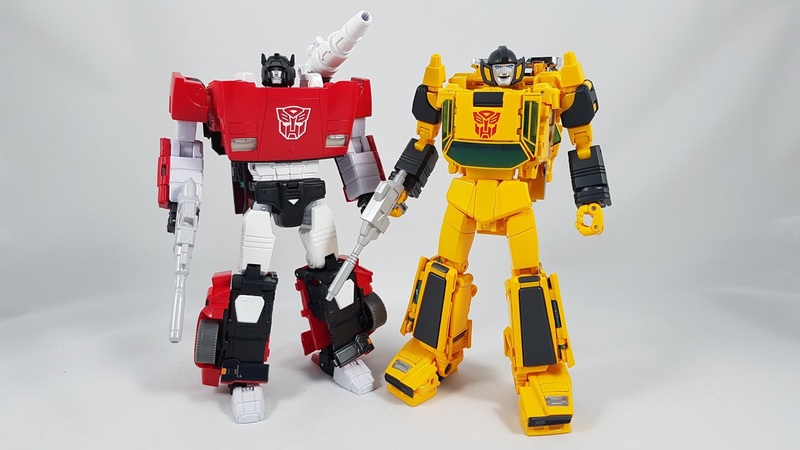 If Takara are able to announce long awaited characters like Jazz, Hound, Mirage, and Trailbreaker in this new style, it will continue to be an amazing time for Transformers fans.